The MV-22 Osprey tiltrotor has a relatively high disk loading, producing visible blade tip vortices from condensation of the marine air in this photo of a vertical takeoff. C-27J Spartan with propeller tip vortices condensation. 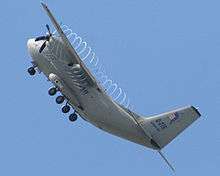 The C-27J uses the same engines as the MV-22, but has higher disk loading. In fluid dynamics, disk loading or disc loading is the average pressure change across an actuator disk, such as an airscrew. Airscrews with a relatively low disk loading are typically called rotors, including helicopter main rotors and tail rotors; propellers typically have a higher disk loading. The V-22 Osprey tiltrotor aircraft has a high disk loading relative to a helicopter in the hover mode, but a relatively low disk loading in fixed-wing mode compared to a turboprop aircraft. Disc loading of a hovering helicopter is the ratio of its weight to the total main rotor disc area. It is determined by dividing the total helicopter weight by the rotor disc area, which is the area swept by the blades of a rotor. Disc area can be found by using the span of one rotor blade as the radius of a circle and then determining the area the blades encompass during a complete rotation. When a helicopter is being maneuvered, its disc loading changes. The higher the loading, the more power needed to maintain rotor speed. A low disc loading is a direct indicator of high lift thrust efficiency. Increasing the weight of a helicopter increases disk loading. For a given weight, a helicopter with shorter rotors will have higher disk loading, and will require more engine power to hover. A low disk loading improves autorotation performance in rotorcraft. 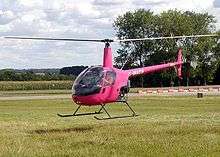 Typically, an autogyro (or gyroplane) has a lower rotor disc loading than a helicopter, which provides a slower rate of descent in autorotation. In reciprocating and propeller engines, disk loading can be defined as the ratio between propeller-induced velocity and freestream velocity. Lower disk loading will increase efficiency, so it is generally desirable to have larger propellers from an efficiency standpoint. Maximum efficiency is reduced as disk loading is increased due to the rotating slipstream; using contra-rotating propellers can alleviate this problem allowing high maximum efficiency even at relatively high disc loadings. The Airbus A400M fixed-wing aircraft will have a very high disk loading on its propellers. The momentum theory or disk actuator theory describes a mathematical model of an ideal actuator disk, developed by W.J.M. Rankine (1865), Alfred George Greenhill (1888) and R.E. Froude (1889). The helicopter rotor is modeled as an infinitely thin disc with an infinite number of blades that induce a constant pressure jump over the disk area and along the axis of rotation. For a helicopter that is hovering, the aerodynamic force is vertical and exactly balances the helicopter weight, with no lateral force. The upward action on the helicopter results in a downward reaction on the air flowing through the rotor. The downward reaction produces a downward velocity on the air, increasing its kinetic energy. This energy transfer from the rotor to the air is the induced power loss of the rotary wing, which is analogous to the lift-induced drag of a fixed-wing aircraft. Conservation of linear momentum relates the induced velocity downstream in the far wake field to the rotor thrust per unit of mass flow. Conservation of energy considers these parameters as well as the induced velocity at the rotor disk. Conservation of mass relates the mass flow to the induced velocity. The momentum theory applied to a helicopter gives the relationship between induced power loss and rotor thrust, which can be used to analyze the performance of the aircraft. Viscosity and compressibility of the air, frictional losses, and rotation of the slipstream in the wake are not considered. So the velocity of the wake far downstream is twice the velocity at the disk, which is the same result for an elliptically loaded fixed wing predicted by lifting-line theory. The pressure along the slipstream is always falling downstream, except for the positive pressure jump across the disk. So, the induced velocity is inversely proportional to the power loading . ↑ Keys, C. N.; Stepniewski, W. Z. (1984). Rotary-wing aerodynamics. New York: Dover Publications. p. 3. ISBN 0-486-64647-5. It is interesting to note that there has always been a strong intuitive association of rotary-wing aircraft with low disc loading which is reflected in the commonly accepted name of rotor given to their lifting airscrews. ↑ Wang, James M.; Jones, Christopher T.; Nixon, Mark W. (1999-05-27). A Variable Diameter Short Haul Civil Tiltrotor. 55th Annual Forum of the American Helicopter Society. Montreal, Canada. CiteSeerX 10.1.1.45.612 . The variable diameter tiltrotor (VDTR) is a Sikorsky concept aimed at improving tiltrotor hover and cruise performance currently limited by disk loading that is much higher in hover than conventional helicopter, and much lower in cruise than turbo-prop systems. 1 2 Rotorcraft Flying Handbook (PDF). U.S. Government Printing Office, Washington D.C.: U.S. Federal Aviation Administration. 2000. pp. 2–4, 19–3, G–2. FAA-8083-21. DISC LOADING—The total helicopter weight divided by the rotor disc area. ↑ Maisel, Martin D., Demo J. Giulianetti and Daniel C. Dugan. NASA SP-2000-4517, "The History of the XV-15 Tilt Rotor Research Aircraft: From Concept to Flight" (PDF) p2. NASA, 2000. Accessed: 17 March 2012. ↑ Noor, Ahmed Khairy (1996). Future Aeronautical and Space Systems (Progress in Astronautics and Aeronautics). AIAA (American Institute of Aeronautics & Astronautics). p. 66. ISBN 1-56347-188-4. Reduced disk loading in the vertical mode also results in lower downwash and improved capability for autorotation. ↑ Leishman, J. Gordon. "Development of the Autogiro : A Technical Perspective" page 5. Hofstra University, New York, 2003. ↑ Reinhard Hilbig; Wagner, Siegfried; Ulrich Rist; Hans-Joachim Heinemann (2002). New Results in Numerical and Experimental Fluid Mechanics III. Notes on Numerical Fluid Mechanics and Multidisciplinary Design. 3. Berlin: Springer. p. 82. ISBN 3-540-42696-5. The A400M will be driven by four modern turboprop engines with a high disc loading.... The disc loading of the propellers is significantly higher than realised on former tactical transport aircraft like C130H or Transall C160. 1 2 3 Johnson, Wayne (1994). "2". Helicopter theory. New York: Dover Publications. pp. 28–34. ISBN 0-486-68230-7. In the momentum theory analysis the rotor is modeled as an actuator disk, which is a circular surface of zero thickness that can support a pressure difference and thus accelerate the air through the disk. ↑ Principles of Helicopter Aerodynamics (Cambridge Aerospace Series). Cambridge, UK: Cambridge University Press. 2006. ISBN 0-521-85860-7. This article incorporates public domain material from the Federal Aviation Administration document "Rotorcraft Flying Handbook".